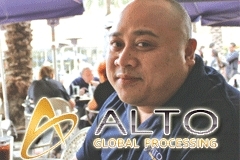 MIAMI — Recently launched Alto Global Processing has tapped industry veteran Albert Lazarito as its new chief operating officer. “Our team has invested a significant amount of time, resources and funding to ensure our product and services were planned and executed in the manner necessary for us to compete,” CEO Luca Bizzotto said. “With this in mind, we recruited Albert and immediately he has proven to be the perfect fit. Lazarito was the first employee with PlatinumBucks, and later moved on to SilverCash.com as its vice president.